The transfer of title presents great promise for the continued vitality of the Studio, and attests to the Gallery’s commitment to carrying on Brett’s legacy to future generations of art lovers. A generous donation of $2 million by Wendy Whiteley has allowed for extended opening hours (open Friday – Sunday, 10am – 4pm) as well as extra programming at the Studio, and further curatorial and research support. Funded by the Beryl Whiteley Estate, the Brett Whiteley Travelling Art Scholarship will also increase from $25,000 to $30,000. In honour of the anniversary, the Gallery will hold an open day event at the much-loved arts space on Saturday 21 February 2015. The open day will celebrate Brett Whiteley’s contribution to Australian art and will feature live music, food and drink and talks by Wendy Whiteley, contemporary artist Ben Quilty, Art Gallery of NSW head curator of Australian art Wayne Tunnicliffe, and author of the newly released Brett Whiteley: drawings Lou Klepac. Brett and Wendy Whiteley first bought the former Surry Hills warehouse in 1985, converting it into a studio and exhibition space where Brett lived and worked from 1988 until his death in 1992. The space opened to the public in 1995, two years after it was purchased by the NSW Government. 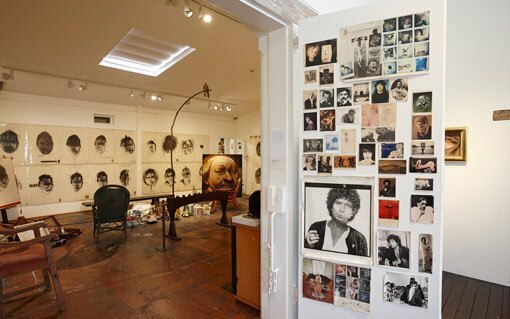 The Brett Whiteley Studio offers visitors the unique opportunity to experience the atmosphere of the artist’s working space, with paintings, art materials, his collection of art books and objects that inspired him, alongside the graffiti wall covered with quotes and images. The Brett Whiteley Studio is supported by principal sponsor J.P. Morgan.